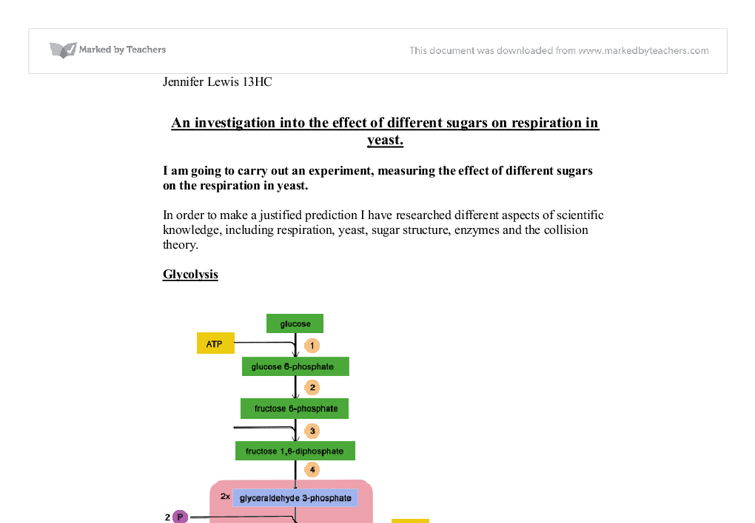 An investigation into the effect of different sugars on respiration in yeast. I am going to carry out an experiment, measuring the effect of different sugars on the respiration in yeast. In order to make a justified prediction I have researched different aspects of scientific knowledge, including respiration, yeast, sugar structure, enzymes and the collision theory. Glycolysis http://people.eku.edu/ritchisong/301notes1.htm Glycolysis is the splitting of a monosaccharide into two molecules of pyruvate. It takes part in the cytoplasm of a cell. Glycolysis begins with a monosaccharide with six carbon atoms, and ends with two molecules of pyruvate, each with three carbon atoms. For the first steps of glycolysis, energy from ATP is needed. However, energy is released in later steps to generate ATP. For every molecule of glucose, a net gain of two molecules of ATP is produced. The first stage of glycolysis is called phosphorylation, and results in hexose bisphosphate. This is shown in green on the above diagram. Hexose bisphosphate then breaks down into two molecules of triose phosphate. Hydrogen is removed from the triose phosphate and transferred to NAD to produce reduced NAD. These hydrogen's can then be used in oxidative phosphorylation to produce ATP. The end products of glycolysis are pyruvates, which still contains a lot of chemical potential energy. There are two molecules of pyruvate generated for every molecule of glucose. 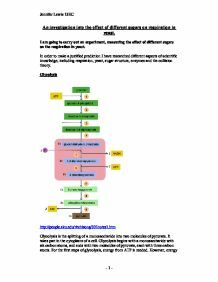 Glycolysis is an anaerobic process, as none of the steps involves using oxygen. Anaerobic fermentation will continue instead of aerobic cellular respiration, as I am using yeast which is deprived of oxygen. Yeast Yeast is a fungus and needs a supply of energy for its living and growth. Sugar is a good supply for this energy. The more sugar there is, the faster the rate of respiration and the faster the yeasts will grow. Even if there is a limited supply of oxygen, yeast can still release energy from sugar. ...read more. 1 2 3 4 5 6 7 8 9 10 Volume of CO2 produced (cm3) 9:1 0.0 0.0 0.0 0.0 0.0 0.0 0.0 0.0 0.0 0.0 0.0 8:2 0.0 0.0 0.0 0.0 0.0 0.0 0.0 0.0 0.0 0.0 0.0 7:3 0.0 0.0 0.0 0.0 0.0 0.0 0.0 0.0 0.0 0.0 0.0 6:4 0.0 0.0 0.0 0.0 0.0 0.0 0.0 2.5 1.5 4.0 8.0 5:5 0.0 0.0 0.0 0.0 0.0 0.0 0.0 0.0 0.0 2.3 2.3 4:6 0.0 0.6 0.0 0.0 0.7 0.0 0.0 0.0 3.1 0.3 4.7 3:7 0.0 0.0 0.0 0.0 0.0 0.0 0.0 0.0 0.0 0.0 0.0 2:8 0.0 0.0 0.0 0.0 0.0 0.0 0.0 0.0 0.0 0.0 0.0 1:9 0.0 0.0 0.0 0.0 0.0 0.0 0.0 0.0 0.0 0.0 0.0 The data shows how much the water moved down the burette (cm3) every minute. The results for the first preliminary test were very disappointing as you can see from the above table. I concluded that this was because there was not enough yeast and sugar for respiration to occur, and that the temperature was too low for the enzymes to work efficiently. As can also be seen from the above table, the most amount of respiration was taking place between 6:4 and 4:6. For the next experiment the amounts of yeast and sugar used were doubled to get 12:8, 10:10 and 8:12. The temperature was also increased up to 40�C to see if it made a difference to the results. The experiment was also carried out on the ratios 15:5 and 5:15 to provide a greater range of results. We also decided to keep the boiling tube in the water bath (to ensure that the temperature stays constant) and to constantly shake the boiling tube to cause more collisions between the yeast and the sugar. Preliminary 2 - 40�C - shaking Preliminary 2 - method * Set up experiment as in Preliminary 1 but with the temperature of the water bath 40-42�C instead. ...read more. Fill a plastic container 3/4 full with water 3) Place a beehive shelf in the plastic tub 4) Fill a burette with water (up to 50cm3) and whilst holding your finger over the end to avoid any spilling of water, place this inside the beehive shelf in the water. 5) Using a clamp and clamp stand, position the burette in an upright position and tighten the clamp. Make sure it cannot move. 6) Take a stretch of rubber tubing attached to a bung, and place it through the beehive shelf, and into the burette. 7) Using a graduated pipette, take 15cm3 of yeast and place in a boiling tube. Keep in the water bath. 8) Place the magnet from the stirrer into the yeast solution. 9) Using a clean pipette, take 5cm3 of the sugar solution and place in the boiling tube with the yeast and magnet. 10) As soon as the solution has been mixed, place the bung in the boiling tube and start the stop clock. 11) Keep the solution in the water bath next to the magnetic mixer and record the level of water in the burette every minute for ten minutes. 12) Repeat for each of the different sugars. Risk Assessment Whilst the experiment is underway, there are various safety aspects that need to be considered. * Take care whilst using equipment made of glass as they can easily be broken and cause cuts or wounds. If you do cut yourself, rinse the cut immediately with warm running water for 10 minutes. * If any spillages occur, clean up immediately to prevent slipping. Also, if anything is spilt near electrical appliances, turn of the electricity and don't operate anything electrical with wet hands. * Safety goggles must be worn whilst measuring the yeast and sugar solutions. Some people are allergic to yeast so if it comes into contact with skin, rinse immediately. * The experiment should take place in an area clear from unnecessary objects like coats or bags * If any of the solutions are swallowed, rinse out mouth with water for 10 minutes. ...read more. A detailed description of preliminary and main experiments together with relevant and reasonably concise background theory. A level biological language is used throughout and there are clear justifications and explanations for predictions, choice of apparatus and methodology. At extreme pH conditions there is low hydrogen ions concentration. As well as that the chemical bonds between the atoms break, causes changes in the shape of the active site, which can also cause denaturation of an enzyme. This can also slow down the rate of reaction. Energy from excited electrons is also used to produce ATP. ADP + Pi (+energy) --> ATP Living Organisms need ATP for many different things. When the temperature is high the ionic bonds, sulphur bridges and hydrogen bonds can be broken altering the shape of the active site and preventing the formation of enzyme-substrate complexes. Therefore, great care must be taken to ensure that the temperature is kept at its optimum. The isolation medium is a solution made up of sucrose and potassium chloride dissolved in a phosphate buffer. The isolation medium provides a buffered environment which does not allow the chlorophyll to leave the lettuce leaves. In this experiment, the light source used was a lamp. The volume of the solution. 1cm3 of each caffeine solution shall be used for every experiment. This volume should be sufficient, as the cavity slide hold ? The time of the experiments shall also constant. The heartbeat of the Daphnia shall be counted for 30 seconds each time. This is because the room operates a thermostat which has a 2-3� variation range. If the ambient temperature drops below 2-3� of a set level, the heating comes on, and vice versa. 2. The number of brine shrimp added to each test beaker must also be the same to the best of our ability.